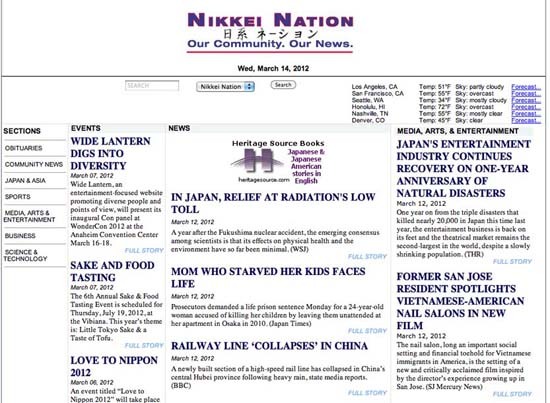 A little more than two years ago I started a glorified hobby called Nikkei Nation, a website devoted to the idea of delivering news of interest to the Japanese American communities spread across the United States. I wanted to utilize what I had learned as the senior online news editor at Hollywood Reporter, a business news daily that at the time covered the entertainment industry, and apply that acquired knowledge to the coverage of the Japanese American community, which was where I got my professional start in print journalism, courtesy of the JACL’s Pacific Citizen newspaper. I envisioned Nikkei Nation as the nexus of my experience in online journalism and Japanese American community news, which for me began at the PC. From my first-hand experience as an online news editor — I was probably among the first journalists to be full-time on the Web — I knew that digital news delivery was where journalism was headed. From my perspective as an online journalist, it was plain to see that digital delivery and the World Wide Web as a medium for news had so many advantages over newsprint as a medium: instantaneous cross-border global reach, interactivity, scalability, multimedia capability, hyperlinking, cost savings, measurement of advertising efficacy and more. Paper as a medium for news had and still has its own unique advantages, capabilities and characteristics (no electricity needed, swatting bugs) — but in the battle of pixels and bits vs. ink and paper, I and others with the sense to see it could tell it would just be a matter of time before market forces and changes in technology would declare the Web a winner in the sometimes uneasy co-existence between online and print journalism. Even as I write this (with a computer, not a typewriter), I know that some will be reading these words on the printed page, while some will be reading it on a screen of some sort. We are still in the crossover period akin to when horseless carriages and horses shared the street, or when people wore either yofuku or wafuku (or some of both) in the Japan of yesteryear. 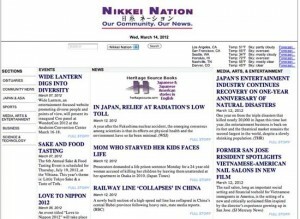 A screenshot of the revamped Nikkei Nation home page. So, armed with that perspective and experience but not much else in terms of resources, my friend Susan Yokoyama and I decided to try and fill what we saw as a void with regard to using the Web to provide news for the Japanese American community. Nature, after all, abhors a vacuum. Also, with the demise of San Francisco’s daily JA newspapers Hokubei Mainichi and Nichi Bei Times, we thought an all-digital Japanese American community news site could help provide a worthwhile service. On Sunday, Susan and I were invited by the San Fernando Valley Chapter of the JACL to talk about these topics, thanks to a fortuitous chance meeting with SFV JACL stalwart Nancy Gohata at a kids basketball game. Unfortunately, Nikkei Nation had been on a hiatus of sorts. Last July I started a new job that demanded my full attention. Also, the CMS (content management system) we were using to produce Nikkei Nation was just too slow and difficult to use for a daily online news website. Add to that the need to sleep (I like sleep! ), finish daily household chores and attend to young children with all their activities, and maintaining Nikkei Nation was exhausting under the old status quo. Fortunately, I had applied for a CARE grant through UCLA, and obtained some funding to be applied toward the website. It took a while but we were finally able to use the money for a new CMS, one that was specifically for online newspaper sites. The new CMS, courtesy of a company called FlexPortal, works great and while we are still learning all of which it is capable, Susan and I were able to show the gathered JACLers a preview of the new look to Nikkei Nation. While those in attendance skewed older, I was happy to learn that most in the audience used email and many used computers to access the World Wide Web. Combined with younger people who grew up with the Internet or those slightly older who use it for work, it bodes well for our vision. Couple that with growing adoption rates for smartphones and tablet computers, I think it’s easy to extrapolate that the momentum is with digital. As of now, the refurbished NikkeiNation.net is up and running. Behind the scenes, it means that updates can be done much quicker, easier and better. From the user’s perspective, NikkeiNation.net looks more like a real news website instead of a bare-bones blog. The improvements translate to greater efficiency, which means we can get back to not only updating the site regularly, but we can resume the daily email newsletter for subscribers and begin to focus on other aspects of what we promised, including Nikkei Nation Magazine, a print adjunct to the website. 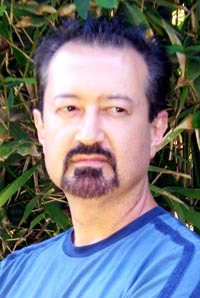 So, whether you’re a subscriber or just curious, I urge you to visit www.NikkeiNation.net and see for yourself. If you like what you see and want more information on subscribing or a trial subscription to the email newsletter, send me an email to the address listed below. But Susan and I also realize we need help in the form of volunteers and interns. One reason is we could use some help, and with today’s economy being what it is, it could bolster the resume of a young person in the hunt for a fulltime job. But it would also be a great way for someone to engage in and learn about Japanese American community activities. If you know of a high school or college age Japanese American or Asian American interested in learning about online journalism and getting some real world experience, please send them our way, again via the email listed below. One of the questions I was asked on Sunday was if we saw ourselves in competition with the Rafu Shimpo. Not so much. The Rafu Shimpo is a venerable, century-old newspaper with a brand name that carries weight and meaning to the Japanese American community. Nikkei Nation doesn’t come close. Still, I know that the Rafu faces a future that is difficult. A “Save the Rafu” drive from a couple of years ago ended without much of a resolution. From the perspective of demographics, the Japanese American community — once the largest Asian American group — has shrunk. The Nisei, who are the most likely among Japanese Americans to support community institutions and businesses like the Rafu, should be put on the endangered species list. The desired success in assimilation and acculturation has largely been achieved, but the downside is the geographic dispersal of traditional Japanese Americans and a disconnect from newer Japanese from Japan, due to cultural and linguistic differences. The difficulties facing the survival of the Rafu Shimpo, much less an upstart like Nikkei Nation, are many. There is, however, still much to be said for Japanese Americans. What we lack in numbers compared with those Asian Americans who are Korean, Chinese, Vietnamese, Taiwanese, Filipino, etc., is outweighed by a collective experience that is unparalleled among Asian Americans. Achievement levels and inroads into mainstream American institutions are high, and we can serve as a worthy example of what works and what doesn’t. NikkeiNation.net is a part of that picture. It may be just barely a business now. But Susan and I, along with those who have so far liked what they’ve seen enough to support and subscribe, gives me hope that we can be something that, along with the Rafu Shimpo and existing community institutions, can continue and perhaps thrive by reaching new, untapped audiences.